A frequent complaint we hear from merchants is the cost of credit card processing. Processing costs can run from 2-4% of a merchant’s processing volume based on their average ticket size and merchant services agreement. For most restaurant and retail businesses, 2-4% ends up being a pretty big number over time, particularly since restaurants on average earn a 6% overall profit. For larger merchants, processing costs can reduce profit by up to $60,000 per year. Where does your business fit in on the table below? Given high processing costs and the fact that accepting credit cards is largely a convenience for customers, should merchants pay card processing fees at all? Historically the answer to this question has been “of course”, unless the merchant elected to run a cash-only business. But today the question of who pays processing fees is open for discussion, thanks to legal rulings and legislative changes that allow merchants to pass on processing fees to consumers. Some POS platforms, including Instore, allow our merchants to legally add a Service Fee to every transaction to cover processing costs. This Fee is eliminated by a Cash Discount when a consumer pays with cash, check or gift card. Consumers paying with credit card are automatically charged the fee, allowing the merchant to recoup the 2-4% they must pay to the card processor. 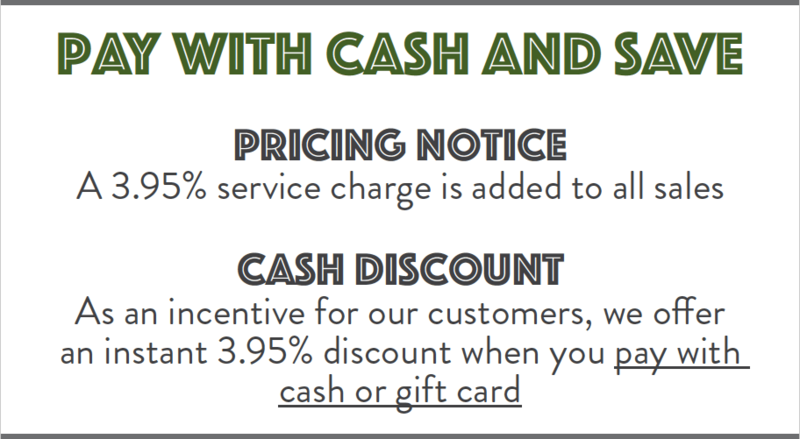 Like many POS features, Cash Discount is a tool that makes a lot of sense for some businesses, less sense for others. Factors like competition, customer mix, and credit card volume all play a role. In our opinion, passing processing costs on to customers is a reasonable business decision in most cases. Retail is a competitive, low margin business, so merchants need all the help they can get. Advertise your Cash Discount program prominently at your point of sale. Make clear to your customers that they can avoid Service Fees by paying with an alternative payment method. Launch Cash Discount alongside a rewards program. Programs like Instore Rewards let customers earn discounts with little to no effort, particularly if they pay by credit card. Regular customers can earn back their Service Fees through Reward Credits when they sign up. Promote gift cards as a tool for avoiding Service Fees. Gift cards are a tremendous cash flow and loyalty tool. Consider discounting cards or offering extra reward points when customers pay with a gift card. In short, give your customers ways to avoid Service Fees plus multiple incentives to come back more frequently through Rewards and Gift Cards. The decision to a) keep paying credit card fees or b) pass those fees on to customers is an intriguing one. We are seeing more and more merchants opt to pass on fees by launching a Cash Discount program. We’re happy to help.